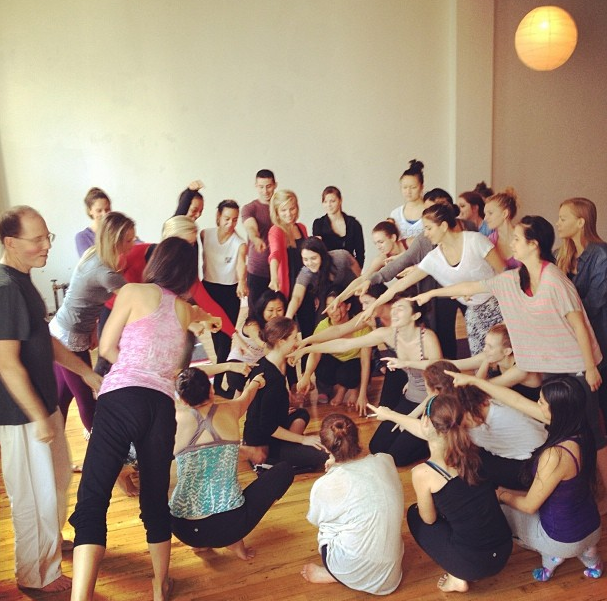 This is my final teacher training post! So so crazy! Saturday Jason Wachob, the creator of Mind Body Green, was our guest speaker. He shared with us how Mind Body Green came about and also talked about nutrition. It was really great. He was very open to answering any questions that we asked and gave us very informative answers as well. I think the best thing that he said to us was to do two things towards our goals every day. I love that idea behind that because it gives you the motivation to work towards accomplishing a goal and also keeps it present in your mind; allowing you to realize that you can achieve it. After Jason left we began leading for one final time! This was the first part of our final exam. Two people would lead and then we’d stop to critique. Mike and Tara would give us encouraging words and tips on how to improve our leading. We got through about half of the class and then it was time to leave. Sunday we began right where we left off on Saturday with leading. I didn’t get a chance to go on Saturday so I went first on Sunday. I always seem to do better if I can just do it right at the beginning instead of waiting a while. That just makes me over think and get nervous. Anyways, we finished up with our leading (everyone passed, yay!!) and then began part two of our exam. We got into groups and Mike and Tara asked us questions as if they were students in our classes. Each group had to answer various questions and explain their reasoning behind the answers. We all passed that as well! Once our exam was over we graduated and got our diplomas! The end of the day on Sunday Tara shared some really sweet words with us and off we went into the world as new Strala guides. “Take really good care of yourself. Practice ease on your mat. Practice ease in your life. Inspire others not by trying to impress, but by being an example. Be easy so you can help others be at ease. Care about people more than poses. Know a clear process so you can guide people toward progress. Practice what you are inspired to do. Lead classes if you want to lead classes. Create your own reality by doing rather than waiting for permission. Work toward what you want with consistency and patience in yourself and others. It’s sad that training is over, it went so fast! I’ll miss everyone I’ve met over the past two months. I’m so grateful to have met them all though, they’re so inspiring in their own unique ways. It’s great! I am excited to start leading my own classes eventually and continue my adventures! This entry was posted in Personal Posts, Yoga, Yoga Teacher Training and tagged me, yoga, yoga teacher training on October 29, 2013 by Amanda - Create N Plate. 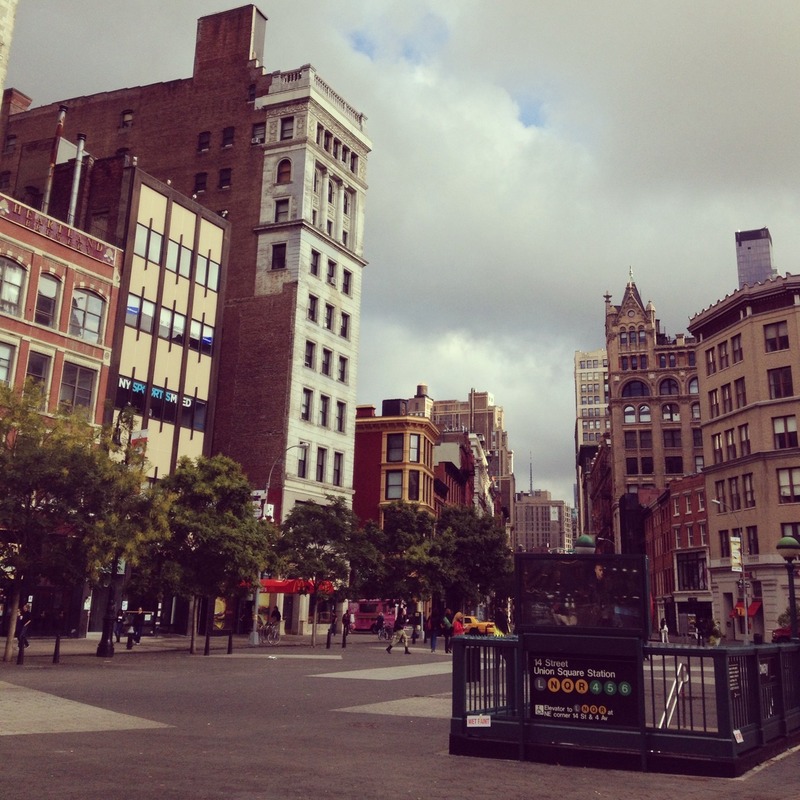 Ah, New York City. I had a stressful weekend this past weekend! It all comes with the experience though! 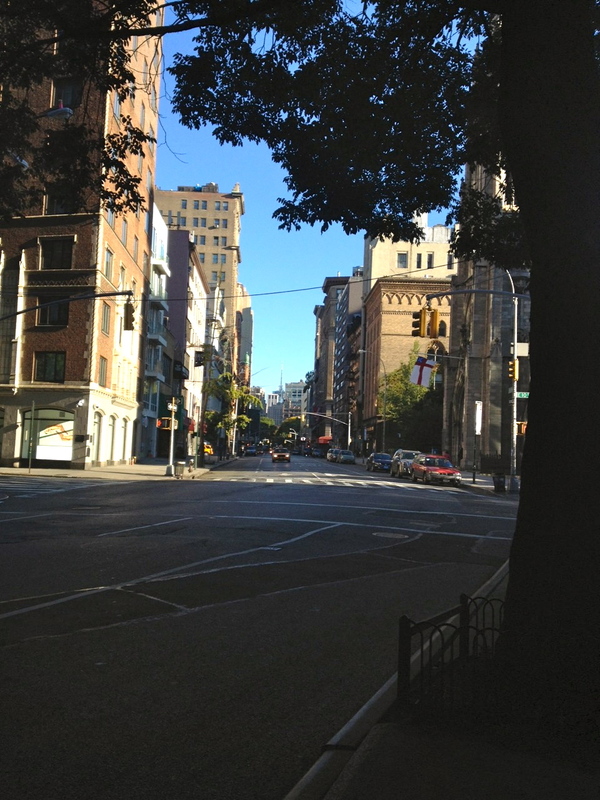 I was a little late on Saturday due to a broken down train and getting lost in Chinatown. But I made it to Strala! 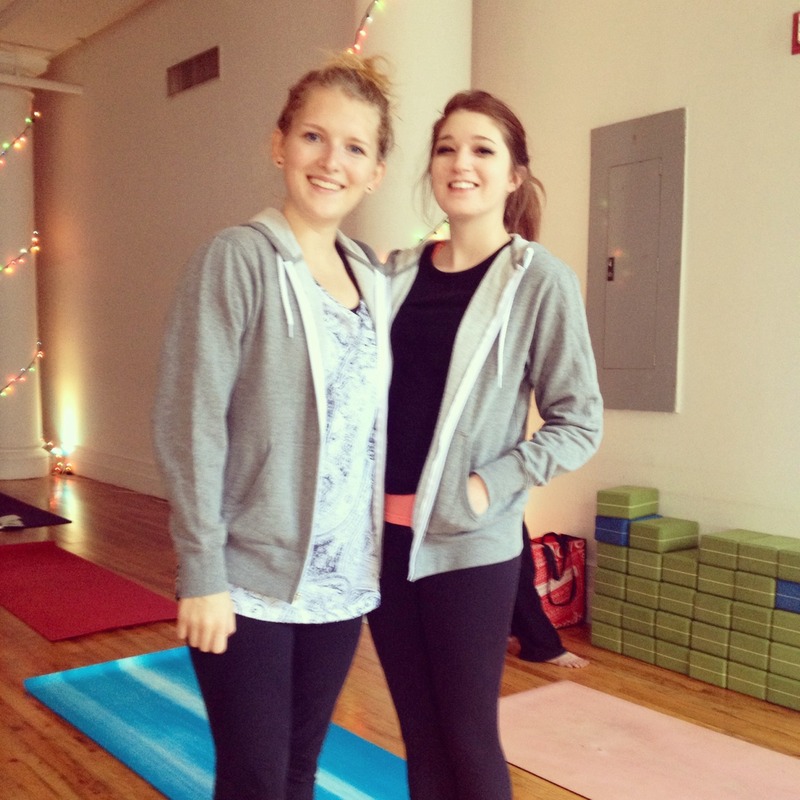 We went over some inversions and things that we did last weekend with Heidi in the beginning. Then the rest of the time we lead. I was so nervous for it. But I’m so glad that we did it, and it’s actually fun! We practiced leading longer sequences this past weekend. It was easier for me to lead a longer sequence than a shorter one because I had the time to “get into the class” before having to get back on my mat for someone else’s turn. After everyone in our little groups got a chance to go, we gave each other tips and advice. Leading days are so exhausting though because we’re constantly moving. But it’s fun! Sunday consisted of more leading (and I wasn’t late this time.) We practiced leading for a great while. Then the last little bit of class we talked about business. We pretty much got to ask questions and have Mike and Tara answer them, wether it was with advice or their own personal stories. Tara shared with us how she built Strala and became so successful. She’s such an amazing person and really wants to help everyone and anyone that she can. Just having her share her experiences with us inspires me to become a better person and try to build my own business (whatever that may be) on sincerity and honesty. After training this past weekend, I’ve been wondering if I’m truly meant to be a yoga teacher or if this training is preparing me for something else. Lots of thoughts and lots of excitement for this upcoming final Strala weekend!! This entry was posted in Personal Posts, Yoga, Yoga Teacher Training and tagged strala yoga, yoga, yoga teacher, yoga teacher training on October 24, 2013 by Amanda - Create N Plate. This past weekend at Strala was one of the best weekends that I’ve had there. It was so much fun! Since Tara and Mike weren’t in town we had Heidi as our instructor. She’s great! 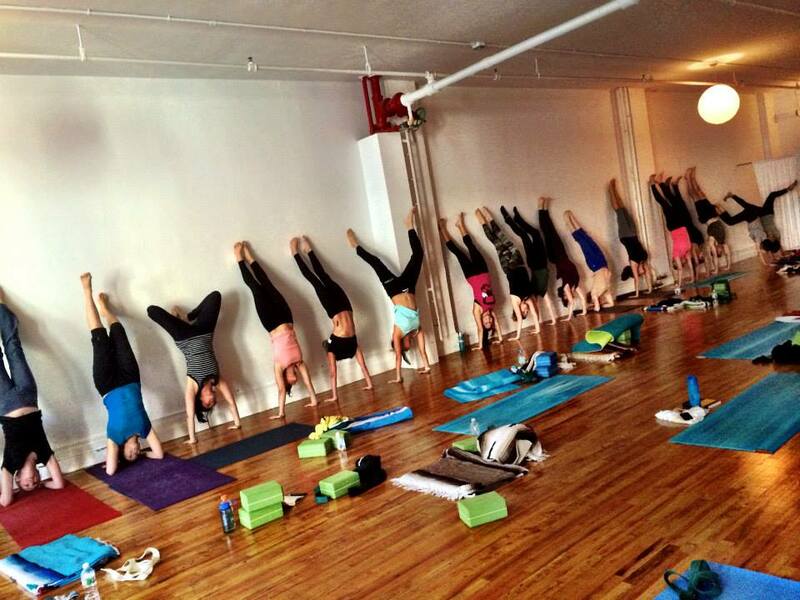 Saturday was all about inversions. Heidi started off the afternoon by telling us about herself and a little bit of what to expect for our time together. We did a short meditation and warm up which was a great way to start. She taught us how to get into inversions, come out of them, and gave us tips on how to stay inverted. She informed us of all the dangers that are present with certain inversions and what to avoid incorporating into our sequences. We learned all of the benefits of inversions and a lot of girls overcame their fears of being upside down. It’s so great to be able to experience that. Heidi was very encouraging towards everyone and really believed in each one of us which is such a motivation to want to do the same in the classes that I’ll eventually lead, and in life in general. We moved a ton on Saturday and used our core and upper body an extreme amount. I was so tired by the end of the day! But it was so much fun that it didn’t even phase me. I was just looking forward to Sunday. Sunday was arm balance day! I was ready to go because I started off my morning by taking Heidi’s Basics class and enjoying a great lunch at Jivamuktea Cafe with a good friend from training. We starting off the afternoon with a little core work and warmed up our bodies. Then we went through various arm balances and used partners, blocks, and straps; trying everything out to see what felt best and worked best for each of us. I never really use straps in my practice at home, but after Sunday I definitely want to start incorporating them into my practices more. If you don’t use straps or blocks, play around with them sometime! Anyways, Heidi showed us safe and easy ways to get into arm balances and motivated us along the way. We went over the ones she had in mind and then she let us choose different ones that we wanted to learn and try out. It was a ton of fun, but about 2 hours in I think it started to show on everyone. I was exhausted! The last bit of time we had together was spent asking questions and learning about a bunch of helpful things. This past weekend was somewhat beneficial towards leading classes, but extremely beneficial towards myself. I enjoyed it and I know others did as well. I feel like using this weekend to work on improving ourselves gives us the opportunity to help others improve through that. I’m extremely grateful that we got to experience this past weekend with Heidi because it was really great. She’s so knowledgeable about yoga, health, and life overall and her smiles and radiating vibes really are contagious and make you smile and appreciate everything around you. I don’t know what’s in store for us this weekend, but I’ll find out soon enough! Only two more weekends to go! 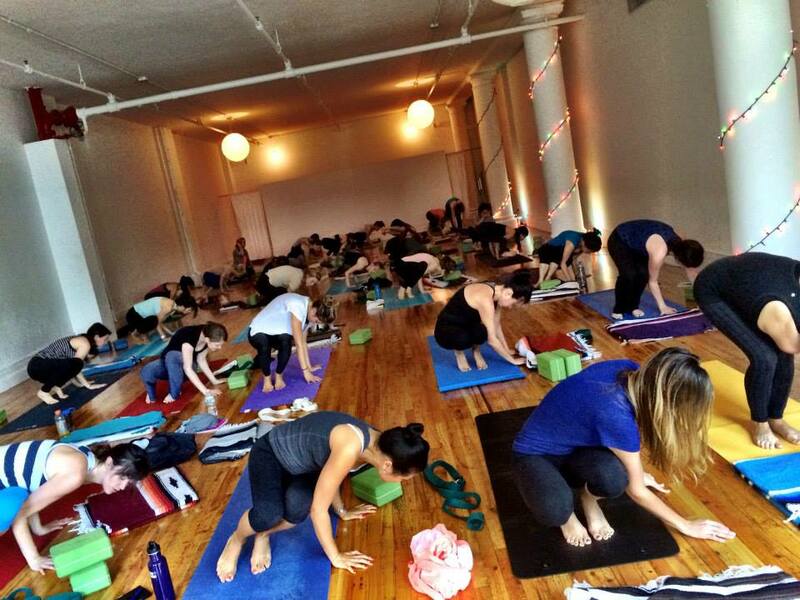 This entry was posted in Personal Posts, Yoga, Yoga Teacher Training and tagged nyc, nyc yoga, strala nyc, strala yoga, yoga, yoga teacher training, yoga training on October 17, 2013 by Amanda - Create N Plate. 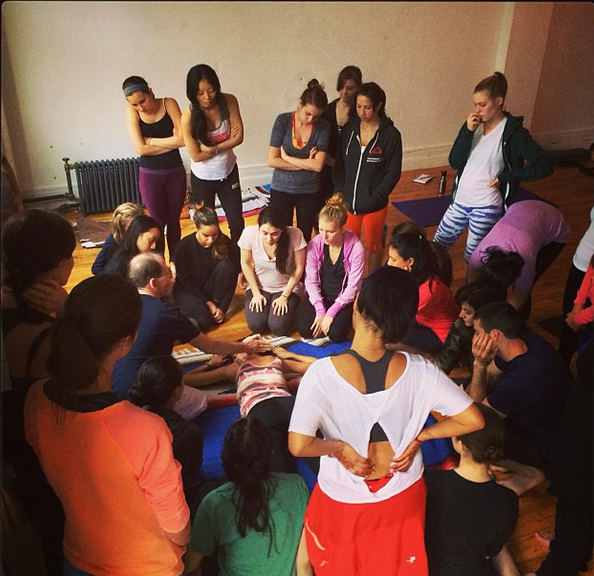 It was anatomy weekend at Strala Yoga this past weekend. Sam Berlind was back once again and him and Mike helped us become more familiar with anatomy of the body. That doesn’t mean sitting there memorizing body parts though! We got hands on experience with some pretty important parts of the body. We focused on the shoulders the whole day on Saturday. We learned about shoulder mobility and got to try out a few partner exercises. Using the technique of “pointing to where it hurts” is actually something really beneficial and a lot more accurate than I first believed it to be! We felt each others shoulders to see how each body is different and difference isn’t a bad thing. 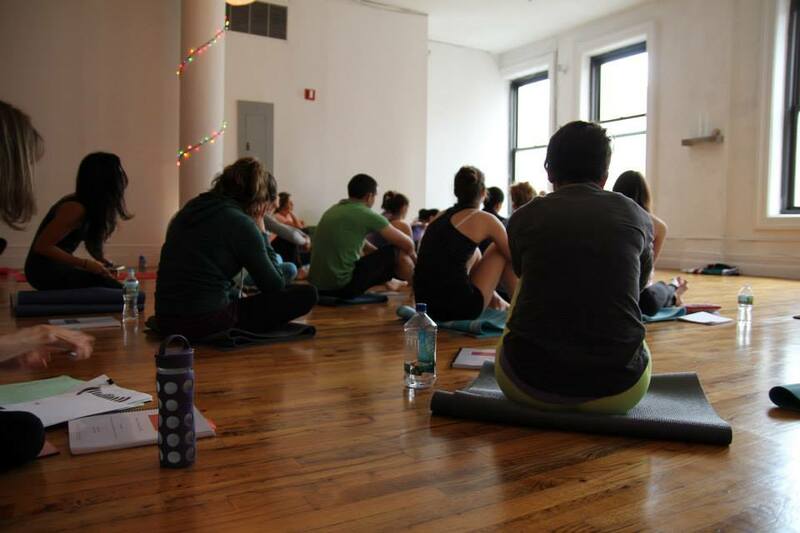 The whole day was basically dedicated to getting to know our body and listening to it. We became more aware of how to answer questions that others ask us about their own bodies. It’s pretty simple. Listening to your body and taking care of yourself does amazing things! There’s not much more to say about training on Saturday. We did quite a bit of hands on work and “diagnosing” which I know will help me out when I start leading my own classes. Sunday morning I went to the 9:30 a.m. Basics class with Suzy. It was my first time taking her class and I really liked it! At training on Sunday it was back and knee day. Yay! We basically did the same thing on Sunday as we did on Saturday, except switching up body parts. We did the group exercises, diagnosing, etc. I really enjoyed the knee portion just because I’ve had knee injuries in the past and found it really helpful. The knees are so important and really hard to heal, that’s why we need to be extra careful and take care of them! This past weekend taught me not only how to help others, but also how to help myself as well. We didn’t do any leading or anything which is something that I really want to practice more to become more comfortable with, although I’m sure that’ll come with time. But I think that once I do start leading on my own, this will all help me help others in the best way possible. We only have three more weekends to go and it’s truly unbelievable. I know that I’m going to miss it so much once it’s all over, so I’m trying to fully experience each weekend and have the best time possible. So excited for the weekends to come! This entry was posted in Yoga, Yoga Teacher Training and tagged me, strala yoga, teacher training, yoga, yoga teacher training, yoga training on October 8, 2013 by Amanda - Create N Plate. Guess what! We reached the halfway point this past weekend. 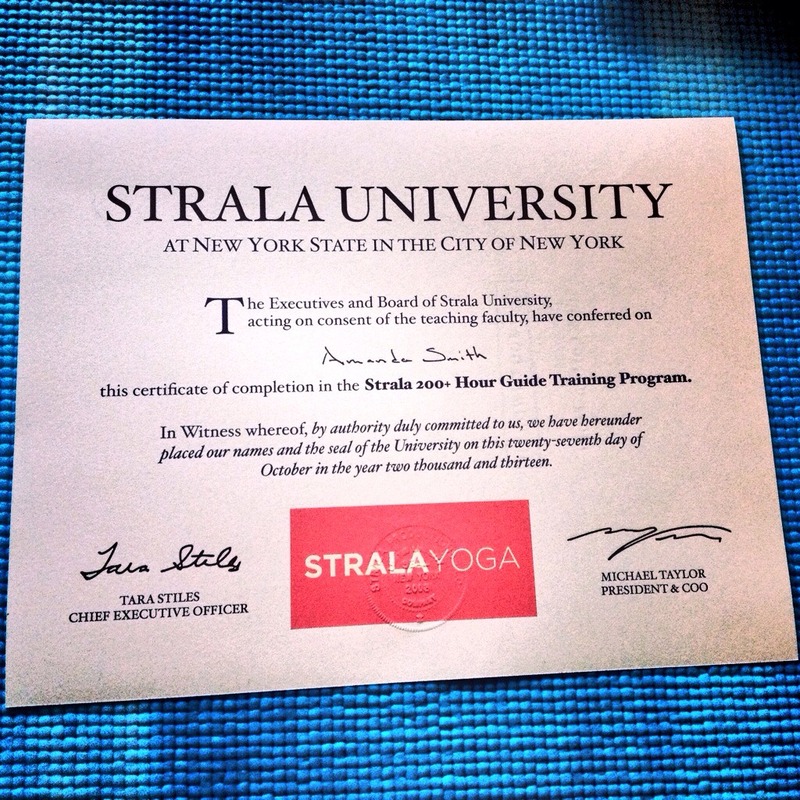 Yes, in 4 short weeks I will be Strala certified. Is this real life? Okay, on to my weekend events! After our meditation and handstand time we started to practice leading again. I never want to lead going into each training day (nerves) but once we start doing it, it is honestly so fun. That’s also a big reason on why I wanted to do this training, I want to become a lot more at ease when it comes to being in front of others. I couldn’t think of a better way to do it than by sharing something that I love. We each got to lead the group in a little flow and then we talked about what was good, bad, etc. I need to work on being louder which is such a struggle for me! I always feel like I’m being loud enough, or even too loud, and then everyone is always telling me to speak up. I’ll work on that though! Overall, Saturday was a great training day. 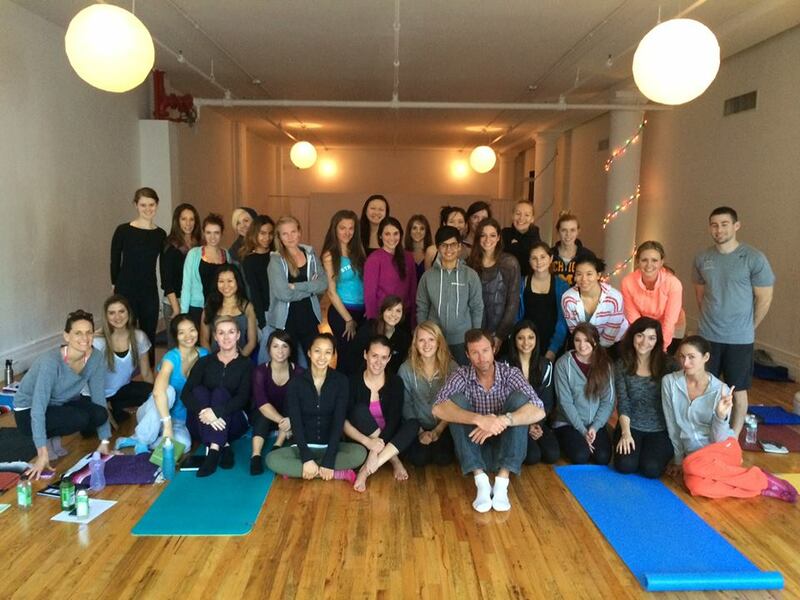 We went over a lot of topic and it’s all so beneficial to my daily life and my yoga practices and teachings. We watched Tara lead a sequence as well and got to see how her personality shines through while she’s teaching and to see how she keeps the energy up in the room. It was really beneficial to watch her lead without doing the flow because we could really get a sense of how much she really does while in classes. Goal of this week: Practice leading!! It’s tough for me to actually do that because I don’t really have anyone to lead. Plus it’s so different to practice here than it is to practice at Strala. Whole different atmosphere. But I’m still going to try! 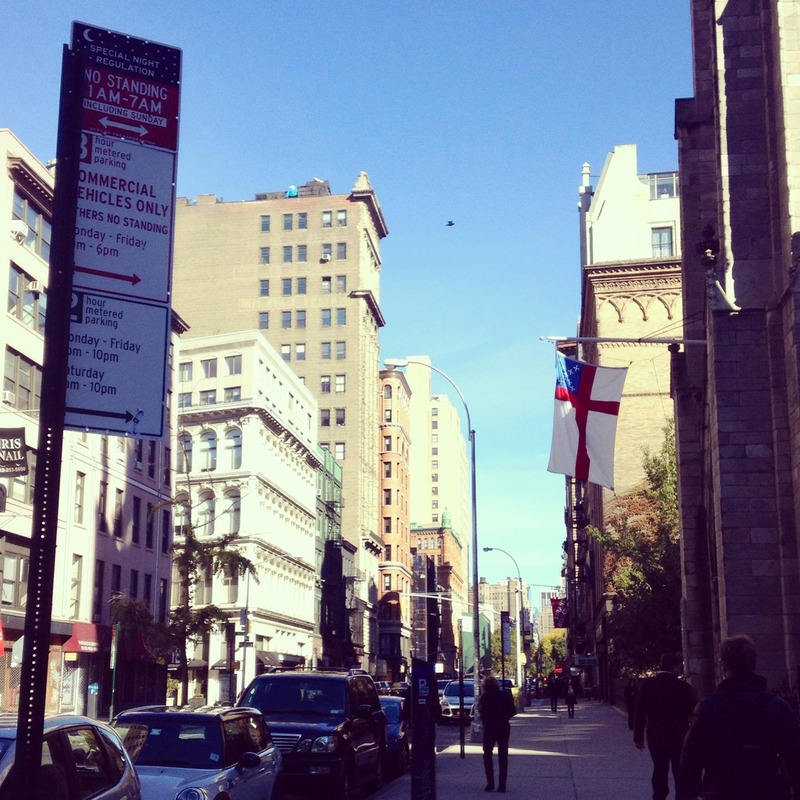 I love training, Strala, the friends I’m making, NYC, basically everything about my weekends. I’m so grateful to be able to do this. I can’t say that enough! Next week we’re working with Sam again and “getting to know our bodies.” I’m excited to see what that actually will involve and just excited to get back to Strala and spend time with the great people that I’m blessed to have in my life. 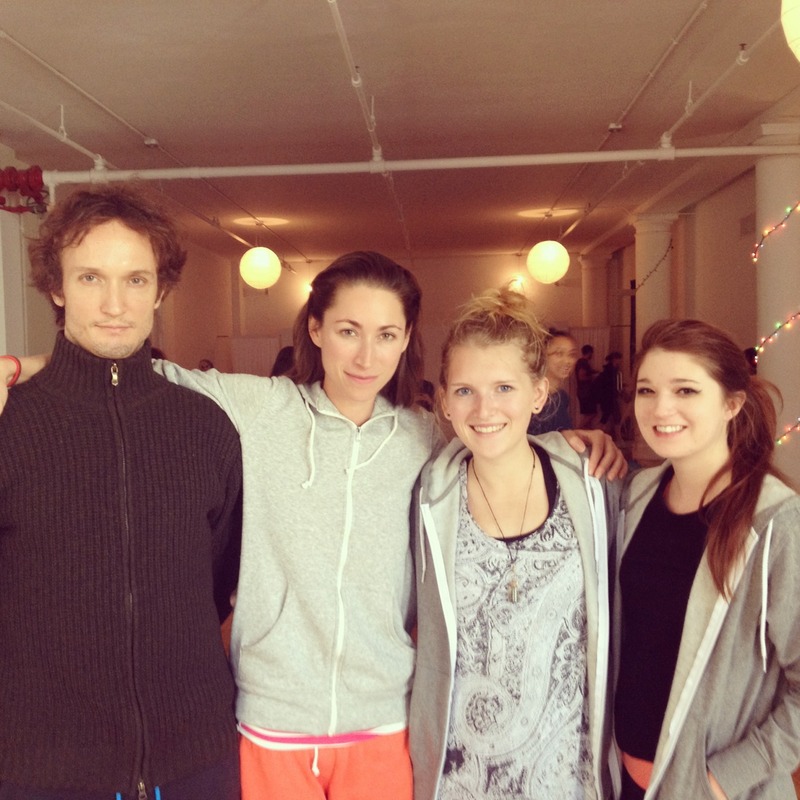 This entry was posted in Personal Posts, Yoga, Yoga Teacher Training and tagged nyc, strala, strala yoga, tara stiles, yoga, yoga teacher, yoga teacher training, yoga training on October 1, 2013 by Amanda - Create N Plate.